Ever since I switched over to Julep's My Maven monthly subscription program, I have been enjoying my Julep Maven boxes that much more, and find myself skipping boxes, less. I think it's because I like having the freedom to actually choose what I want to receive in my box, rather than ending up with a curated box that contains products that I may otherwise not really care for. FYI: My Maven is $24.99/month-or $19.99/month with a three month prepaid subscription. The box is completely customizable and you receive $40+ worth of Julep products. There is also another subscription option called Maven Luxe, which is $39.99/month-or $34.99/month with a prepaid subscription. It's also customizable, and in that box you receive $60+ worth of Julep products. For February's box, I received three nail colors-two of which I had fun sporting over the Valentine's Day weekend, and a face serum that I have been wanting to try forever. I had a few Jules points in my account that I used towards a couple of tools that I thought would really come in handy. Overall, I was very pleased with this month's box, and I can't wait to see what is in store for March! Alaina: Taupe Creme. This neutral hue is one of those colors that looks good on everyone. It's easy to wear and it's just great for all year round. Such a great addition to my collection. Janie: Sheer Pink Creme. I can never get enough of nail colors like this one. I sported Janie over the Valentine's Day weekend and I couldn't get enough of it. The soft pink hue is pretty, delicate, and for being on the sheer side, the formula was surprisingly pretty nice. Hartleigh: Holographic heart glitter top coat. This polish was a free subscriber bonus and I am so glad that it was included in this month's box. Hartleigh was the perfect compliment to Janie and it made for a fabulous accent on the nails. The glitters and hearts are so fun! What Your Skin Needs Restorative Facial Milk: Combating the dryness in my skin has been pretty challenging. More so during the colder season. 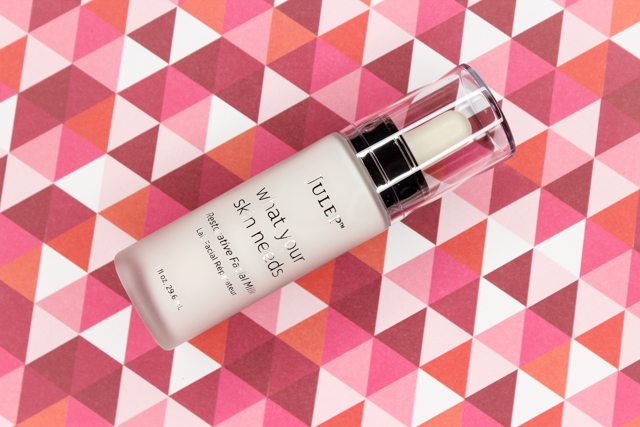 I am always on the lookout for skincare products that will help hydrate my skin and I think I may have found a good contender in Julep's What Your Skin Needs Restorative Facial Milk. It contains a blend of five skin boosting oils (Jojoba, Argan, Coconut, Olive, and Squalane) that help treat, nourish, hydrate, and replenish. I massage one drop onto my face after cleansing, and I love how quickly it softens and hydrates my skin. The milky texture of the moisturizer feels nice on the skin, and absorbs pretty quickly without leaving behind an uncomfortable residue. Clean Slate Polish Corrector Pen: I can't believe I have never invested in a nail polish corrector pen before. I can see why they are so nice to have around. It quickly removes any excess polish that may have gotten on the skin, and it's mess free and so travel friendly. What's not to love? Bonus-refill tips are also included. 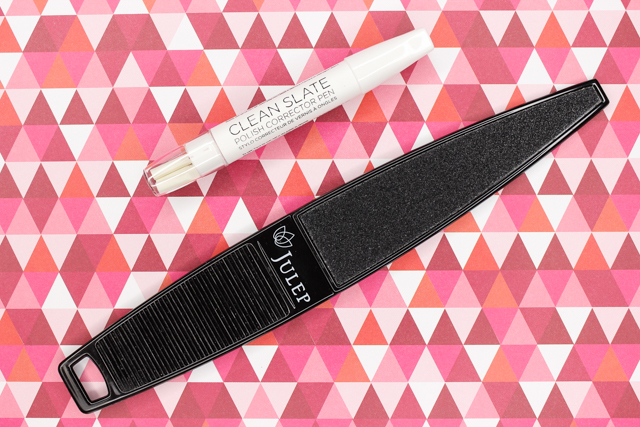 Foot File: Works great to quickly smooth heels and remove calluses. If you want to sign up for a monthly Julep Maven subscription you can so so, here. What did you all receive in your February Julep Maven boxes?